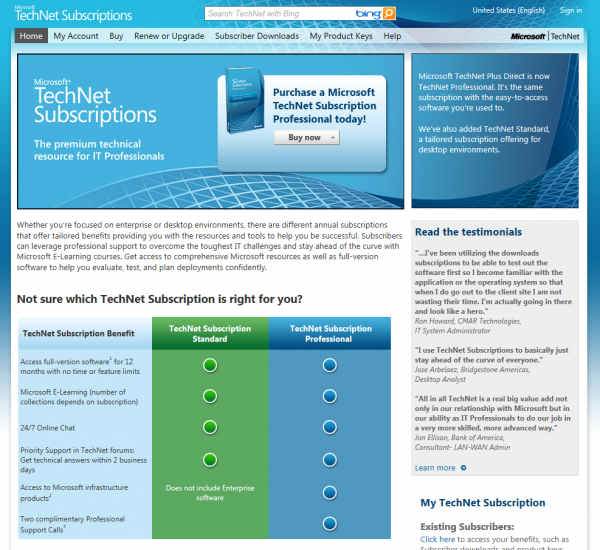 In September 2010, citing concerns over piracy, Microsoft slashed the number of product keys available to subscribers of its TechNet service from 10 per product down to 5. This caused some arguments but Microsoft still insisted that the annual subscription of $349 was great value for what you got. Now though the company has announced that the number of available product keys is to be slashed even further to just 3 per product. So what does this mean? Fortunately it doesn’t mean that for $349 you only get three Windows product keys and three for Office. You will get three for Windows 8 Home Premium, three for Windows 8 Professional, three for Windows 8 professional Plus, three for Windows 8 Ultimate and so on. For office it’s three for Office 15 Standard and three for Office 15 Professional etc. That’s still excellent value for money for software that’s just “for evaluation purposes”. Each licence will still also do 10 activations so so that will make up 24 installations of Windows 8 which is enough for anyone to “test”. Beginning in mid-March 2012, subscribers to TechNet Subscriptions (excluding TechNet Standard which are entitled to 2 keys per product) may access a maximum allocation of three (3) product keys for Microsoft Office and Windows Client products in connection with their subscription. The allotted keys may only be used for software evaluation purposes. Once the maximum keys have been activated, no more keys will be made available. Additional product keys may be acquired through the purchase of an additional subscription. Reaching your limit means that you have claimed the maximum number of keys allowed for your program benefit level within a 24 hour period. Every 24 hours you may claim another set of keys, up to your program levels maximum. Why has Microsoft limited my access to product keys? We are acting to protect the value of your subscription. If we did not act to prevent abuse of subscriptions we would eventually have to either limit the products available in a subscription or raise the price of your subscription. We believe that this is the best compromise to continue to deliver the highest value to you while limiting abuse at the same time. Some people might turn off TechNet now or perhaps take up a pricier MSDN subscription instead, though the question now needs to be asked how long it will talk for Microsoft to reduce the number of MSDN keys as well. It’s a blow to existing subscribers, especially to long-time subscribers such as myself who need to be able to test different hardware configurations, dual boot systems and virtual machine environments. For those however there are the trial versions of Windows and Office. Office 2010 has a 60-day trial verstion and hopefully this will continue with Office 15. Windows 7 also offers a 30 day trial version and we can only hope that Windows 8 does to. This will help circumvate some of the issues regards fewer keys being available from TechNet.